Initiates are new members to Damage Incorporated and are welcome to attend any general guild meetings or events. Defenders are encouraged to participate in guild activities, guild forums, and help fellow members whenever possible. A Raider is a member that actively participates in a Damage Incorporated progression raid. 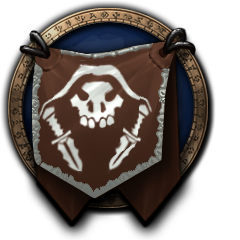 A Veteran is a member who has shown loyalty to the guild and helps organize and/or lead guild activities. This is the highest non-officer rank. Must be a member of the guild for at least 1 Year. Must be a member of the guild for at least 2 years. Senior Officers are chosen from the Officer group to fill in as Guild Leader as needed. Must have demonstrated ability as an officer in Damage Incorporated. Must be a member of the guild for at least 3 years. The old guy that gets to sit back and delegate everything to others since he is too busy, lazy or unqualified to do it himself. Must be in the guild since 2006. Or Dethrone Guild Leader after inactivity timer expires.